AMERICAN CANYON — Napa Valley’s animal rescue operation is looking for a permanent home, and American Canyon may have the perfect spot. Last month, the city was approached by the Wildlife Rescue Center of Napa County about a parcel of undeveloped land near the wetlands known as Clarke Ranch. The nonprofit organization, which has been around for 25 years, has never had a permanent place of its own to hold, rehabilitate, and release back into the wild wounded, sick or orphaned animals and birds. Instead, it has had to rely on a Napa veterinary and the homes of numerous volunteers to care for the hundreds of creatures it takes in each year. So the rescue center’s vice president, John Comisky, made a pitch to the City Council just before the holiday break about building a facility at Clarke Ranch. Comisky said the new facility, which would include an animal hospital and visitor center to conduct education and outreach, would require 3-5 acres of space. Clarke Ranch is approximately 20-25 acres in size, but cannot be developed for private use and must be reserved for public benefit, according to the terms the city agreed to when it bought the land back in the 1990s. City leaders reacted favorably to the rescue center’s proposal, and said they would include the organization in discussions expected to take place this year to create a master plan for Clarke Ranch. Comisky said his organization was still in the early stages of launching a capital campaign to raise money for building the new center.He added that his group is talking to other communities in addition to American Canyon about locating the facility somewhere once they have the funds to break ground. The rescue center helped nearly 1,200 birds and animals last year, according to Comisky. That work was largely done out of people’s homes functioning as “satellite care centers” where everything from squirrels and skunks to foxes and turkey vultures were nursed, fed, exercised and prepared for returning back to their natural habitats. “We handle all animal life but are prohibited from handling big game animals,” said Comisky about his organization, which is licensed by the California Department of Fish and Wildlife and permitted through the U.S. Department of the Interior’s Fish and Wildlife Division to rehabilitate migratory birds. 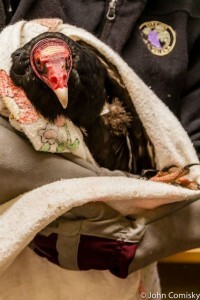 The center gets help from Silverado Veterinary Hospital in Napa, which performs intake services on birds and wild animals brought in by residents.But it is the only operation of its kind in the area to carry out its mission without a real base of operation. “At this time, Napa County is the only North Bay county that does not have a physical wildlife rescue and rehabilitation facility,” according to the group’s website.